These guys are super cool, but apparently they aren't able to be their own dedicated army. Which means I either need to pick up some Space Marines or some Imperial Guard to run along side of the Skitarii. I'm not really into the Imperial Guard, but I do love me some Space Marines. Seeing as the Adeptius Mechanicus is highly technological, I have the feeling to build a themed Space Marine force based on the Iron Hands faction, thus drifting away from the Blood Angels. The Iron Hands feel that their human flesh is weak and easily corruptible and fit their bodies with cybernetic enhancements to purge that possible corruption. That got me thinking. What if I allied the Skitarii with a Iron Hands successor chapter, who took cybernetics to the extreme. A chapter dedicated to ridding themselves of all flesh and converting themselves wholly to the machine. It sounds super cool! 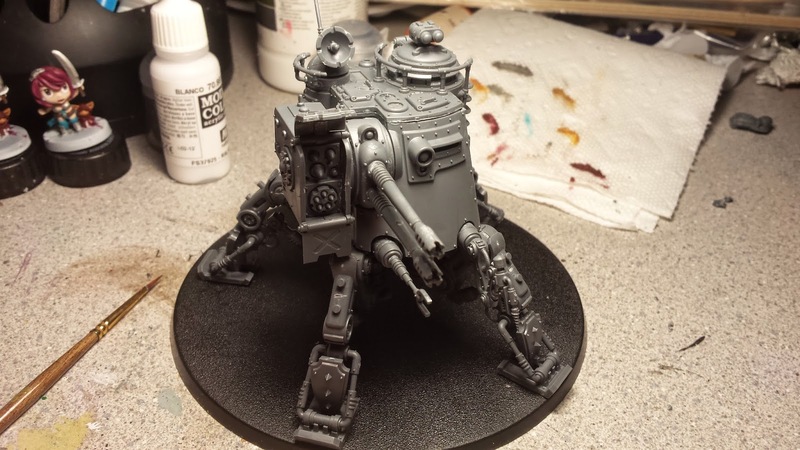 Plus Games Workshop already sells an Iron Hands conversion kit that includes cybernetic arms and legs and I have ideas for a few special conversions as well. Of course, there is a downside to everything. 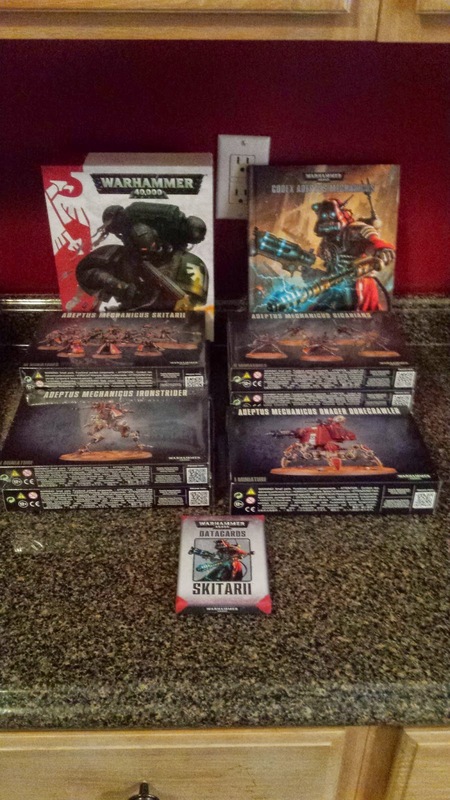 The money that I spent on starting the Skitarii side of the army was the money I was going to spend on the 40k Chess set. But the idea of taking an army to Cons to play against the US #warmongers folks I know in the friendly games was too much of a pull. So that means the Chess set is now on indefinite hiatus. 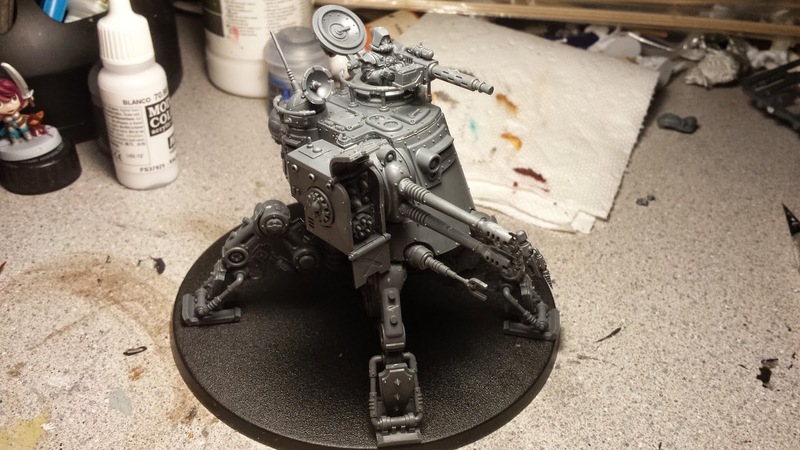 But I did get the Onager Dunecrawler mostly assembled and it's freaking sweet! I had hoped that I could build all of the weapon options for it, like you can with the Dreadnoughts. But because of the way it goes together, you are forced to choose one set up. I was able to modify it a little bit and hinged the manhole lid. That way I can run it with or without the gunner in place. Of course, I don't know how that changes the rule for him yet, as there isn't anything listed in the Onager's stat block about the gunner. I'll have to check the main rules and see if it says anything.